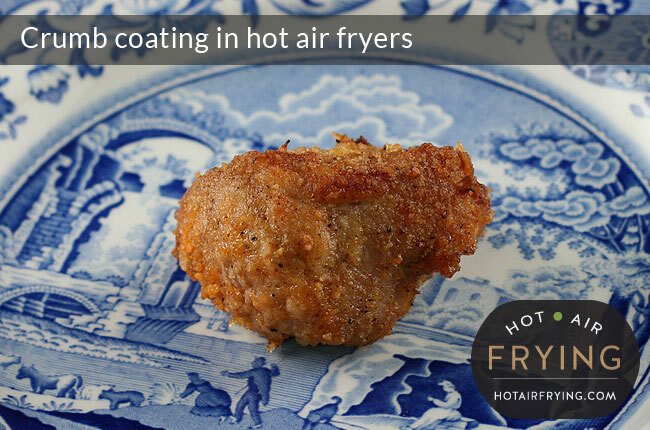 Hot air fryers are fabulous at cooking foods with crumb coatings on them. 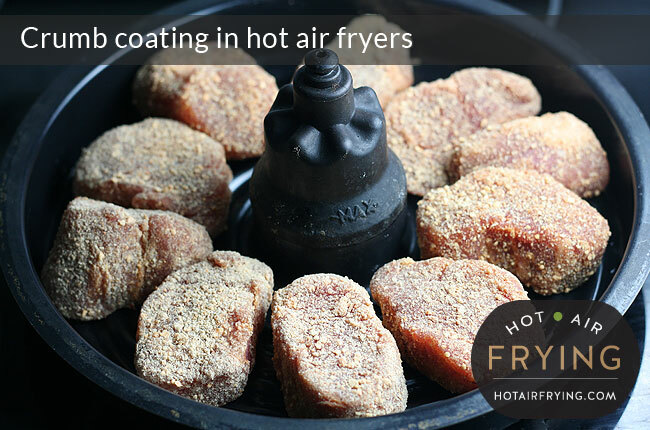 You can’t a use paddle-type air fryer with the paddle in, though, or the paddle will rip the coating off. 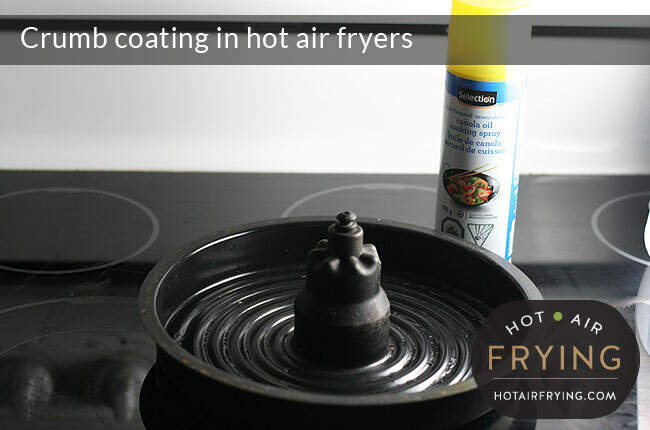 You need to take the paddle out, or use a basket-type air fryer, or a paddle-type that has been specially adapted, such as an Actifry with a snacking grill basket insert, or an Actifry 2 in 1 with the top grill pan tray. However you do it, the advantage over using an oven is that the food will cook up far faster, and moister. 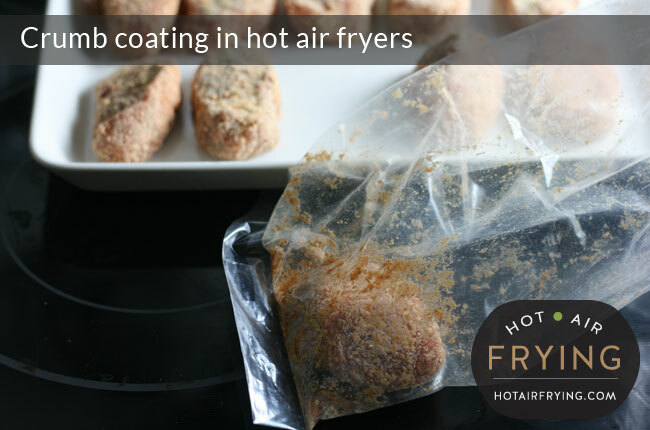 There’s a second trick, though, to knock your crumb-coated item out of the park: very lightly spray it with cooking spray before cooking. For this demo, we’re going to use as our crumb coating the packaged and seasoned crumb coating called “Shake ‘n Bake™”, a stalwart of North American kitchens since 1965. Sure, every cook worth their salt knows how to make their own from scratch, but on busy weeknights every minute saved can help. 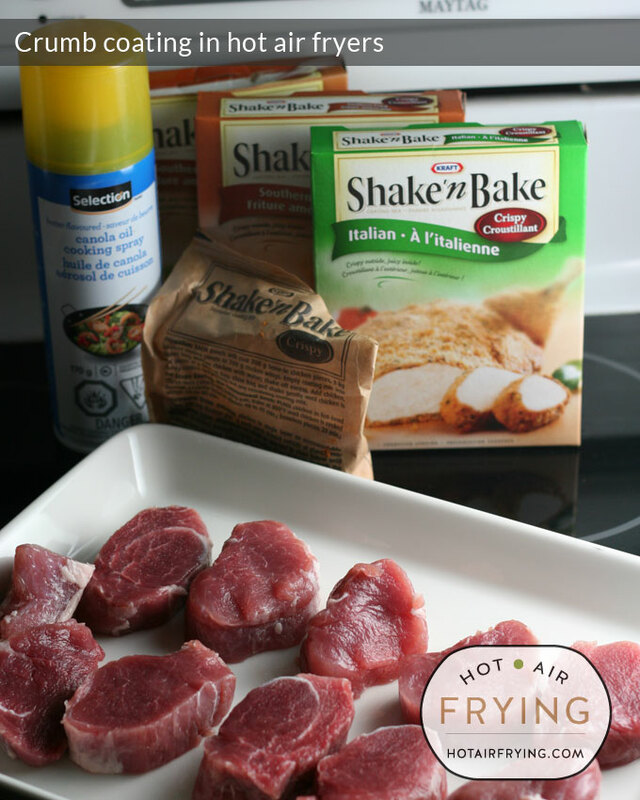 We’ve got just three ingredients here: some lean pork medallions, some cooking spray, and a box of Shake ‘n Bake. Usually we use the low-sodium version, but the grocery store was out and so we didn’t have any to hand for this demonstration. Here’s our pork medallions: just a piece of lean tenderloin cut into slices. We’re going to coat these pieces with the Shake ‘n Bake. The coating mix comes with a bag to do the shaking in. It works best if you just do a piece or two at a time, with a lil bit of coating mix each time — that helps prevent coating mixes becoming “clumped up”, which is when they stop working. There’s no need to dip the pieces of meat in anything first before coating them; this stuff — Shake ‘n Bake — is designed to stick right on, and it does. That one stray piece of pork off to the left is the tip of the tenderloin strip — waste not, want not. This is the last piece of pork getting coated. 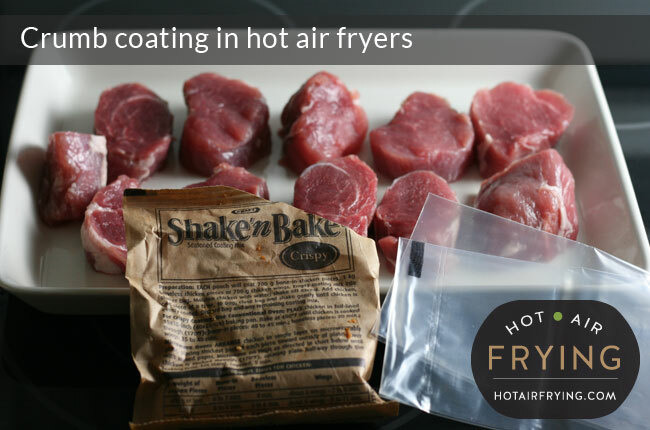 Notice the minimal amount of coating in the bag: it does work better this way, and, helps prevent unnecessary wastage because of course any coating leftover in the bag is garbage, having been exposed to raw meat. Here’s our tray of coated pork tenderloin medallions, all shake’d up, including that stray lil orphan tip piece. Looking good so far. Nice and evenly coated. Here’s our coated pieces now placed into / onto the cooking platform, in this case the grill pan. If you’re using a basket-type device, picture these in your basket. 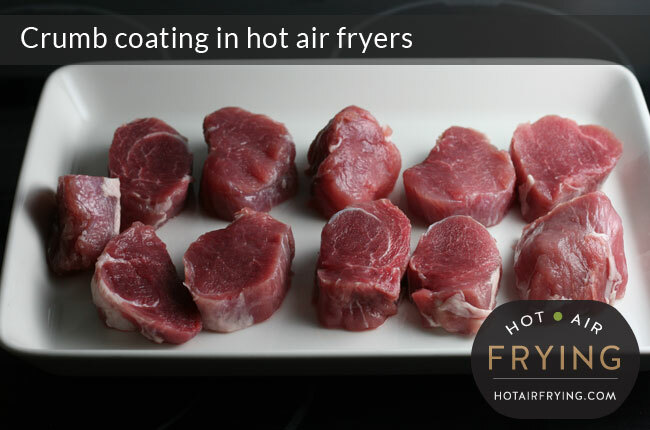 If you are using an Actifry with the paddle out, spray the pan and place the pieces into the pan. Now, we apply the great cheat, the magic trick, the piece de resistance: the cooking spray on top. 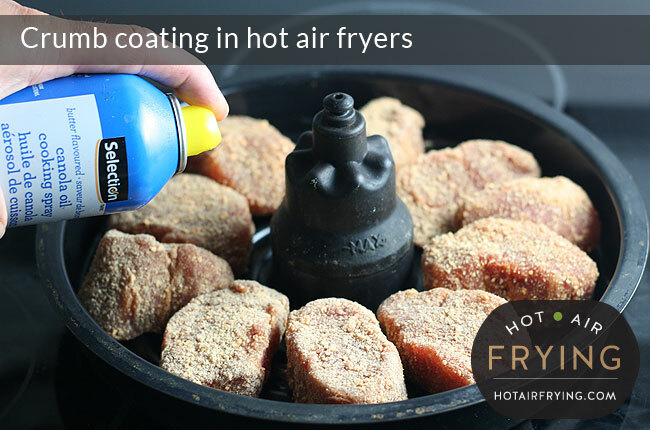 Lightly spray the tops of the food with cooking spray. If you’re using a basket type device, after doing this, then raise the basket in the air and lightly spray the bottoms of the food items from underneath. Here are the coated and sprayed pork pieces, ready to go. I popped the pan into the Actifry 2 in 1, and gave them 10 minutes of cooking time, which normally should do it. There were a bit cold going in though — normally I allow meat about 20 minutes out of the fridge to come to room temperature, but didn’t have time to on this occasion — so I gave them an extra two minutes after that, which also helped make sure that they browned up very nicely for the camera. And here is the pan, all done. Don’t they look crispy and moist? And remember how very lean the meat used is! These puppies just scream crunchy and juicy. You’d forgive someone for guessing that these had in fact been deep-fried, because they look it. The give away is when you bite into them. 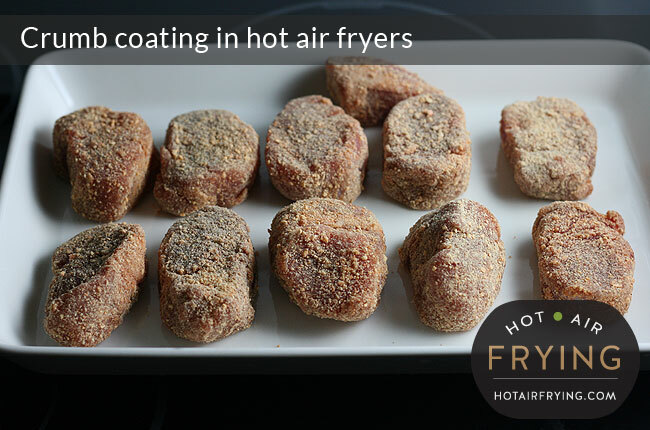 Not because of the coating — no sir, that will make you think deep fried. 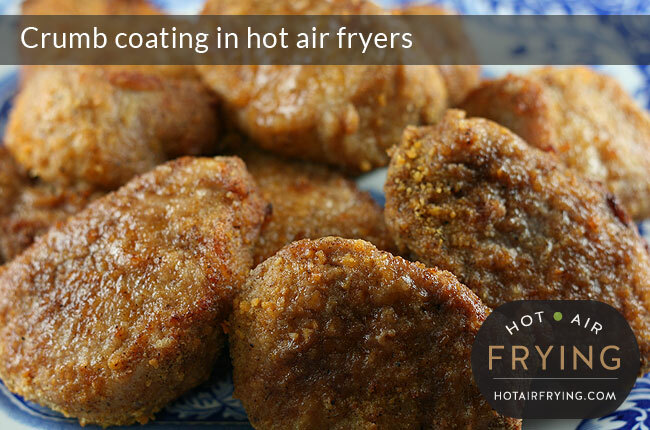 But rather, because of how moist the meat inside is — it’s not dried out the way deep frying can dry out a piece of meat. It’s just plain downright succulent. 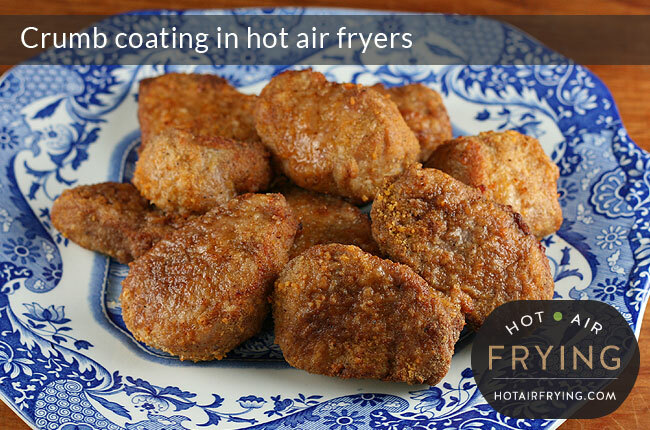 I tell you, coated foods love hot air frying. You’ve never had better “Shake ‘n Bake” in your life. And faster than oven baking, too. WAY faster. That might be part of what helps to keep the meat juicy — avoiding that long baking time in the oven. Who knows. Anyway, here ya go. Dinner’s served. Help yourself. Oh, and that teeny lil stray orphan piece? * AirFryer™ is a registered trademark of Philips, Netherlands. I have the regular ActiFry and LOVE it, but when I want to cook things like this, they have to go in the oven. Can I get an insert like this for the my ActiFry? I NEED this!! 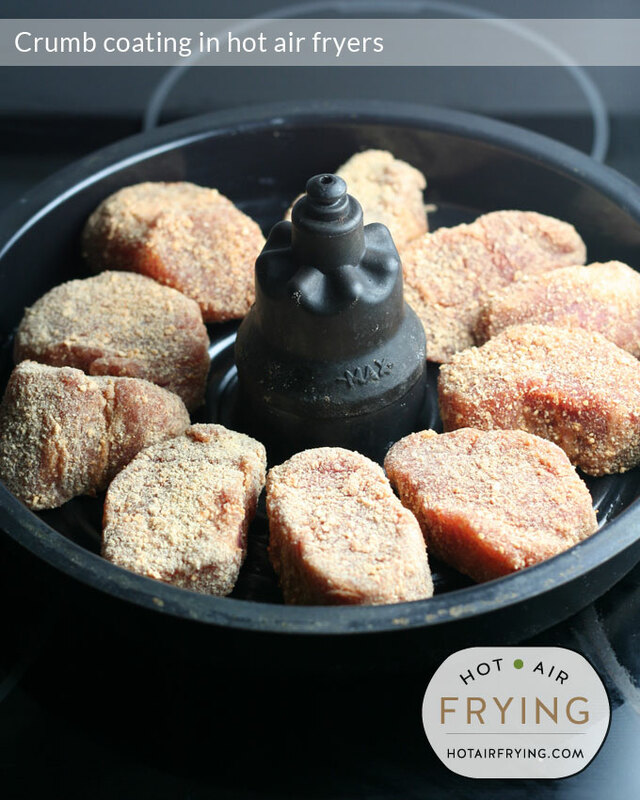 The ActiFry is one of the most used appliances in my kitchen! Hi Janet, the solid metal insert you see comes with and only fits / works with the Actifry 2-in-1 model. 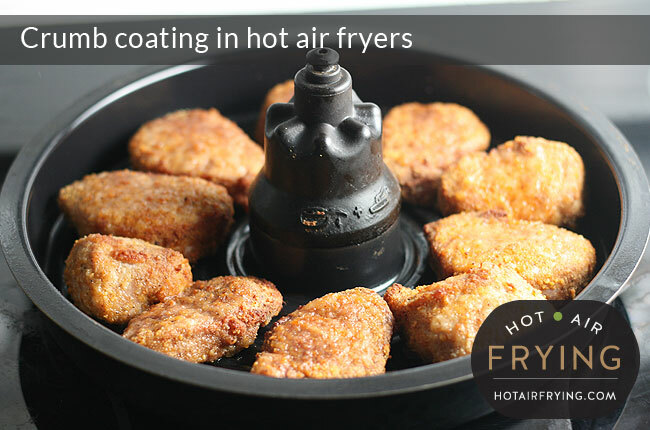 The Actifry Classic model will take the Snack Basket wire frying tray attachment (seen here: https://www.hotairfrying.com/actifry-snacking-basket). You can buy that tray in Europe, the UK, and NZ so far that I know of… if you are in North America (or Australia, it seems) you need to email or Facebook T-Fal and tell them to get a move on in selling it where you are. 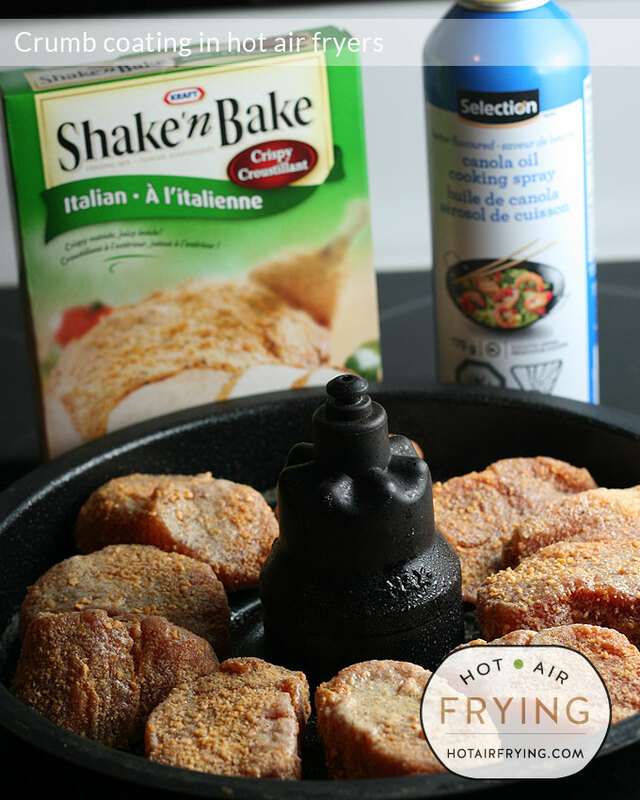 In the meantime, you can just simply use your Actifry Classic pan without the paddle in it. It won’t turn, but the food will still cook faster and moister than in an oven. I just take my paddle out of my classic Actifry too. It works the same way. Its great for delicate things like onion rings, some nuggets and fish sticks. If you are in Canada you can get the fry basket insert for the classic at Canadian Tire, I picked one up yesterday. I’ll let Robin answer how much it was. For spare parts, phone T-Fal Canada, though sadly I think they just closed for the day (today being Friday) an hour ago. T-Fal Canada / Phone: 1-800-418-3325. Monday – Thursday 8:30am – 4:30pm, Friday 8:30am – 1:00pm. What should the temp be I have a philips? Cooks prerogative is REAL… Thanks for vindicating me!